Walmart is surging after crushing earnings estimates Thursday morning, adding about $US12 billion to the wealth of the Walton family. An investment of $US1,000 at the start of 1980 would be worth over $US1.9 million today. Walmart’s stock price is surging after the company announced better-than-expected earnings results Thursday morning. As a result, the Walton family – the descendants of the retail mega-giant’s founder – gained about $US12 billion in wealth Thursday morning. 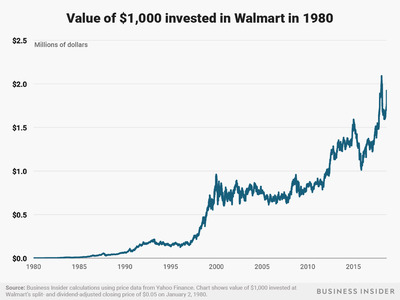 According to Yahoo Finance, Walmart’s split- and dividend-adjusted closing stock price on January 2, 1980 was a little over $US0.05. As of 1:15 PM ET Thursday, Walmart was trading just shy of $US99 per share, up nearly 10% on the day.